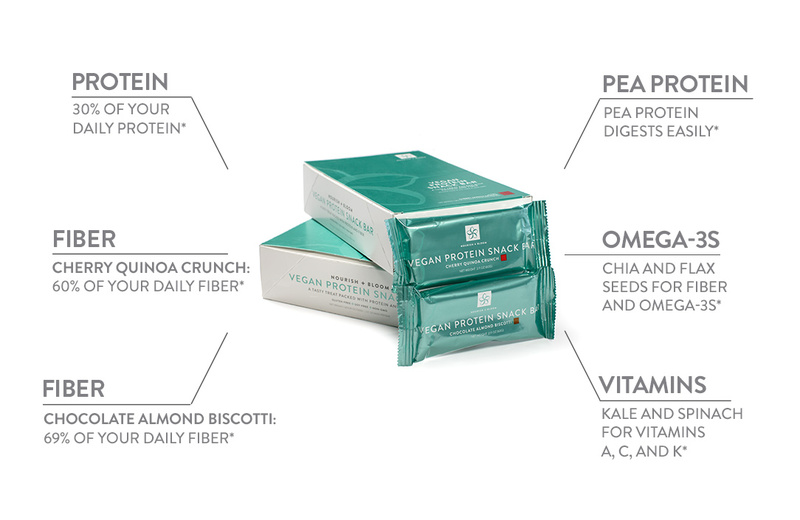 Our bars are made of real, whole food. They’re also full of protein and fiber so you feel full and energized, even hours after your snack. 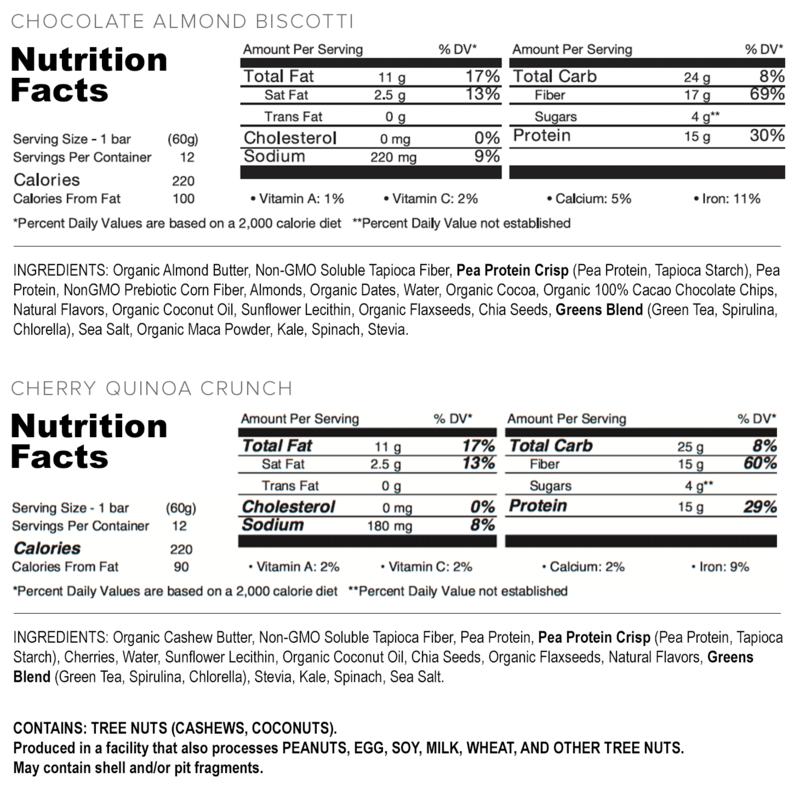 How much protein is in the snack bars? 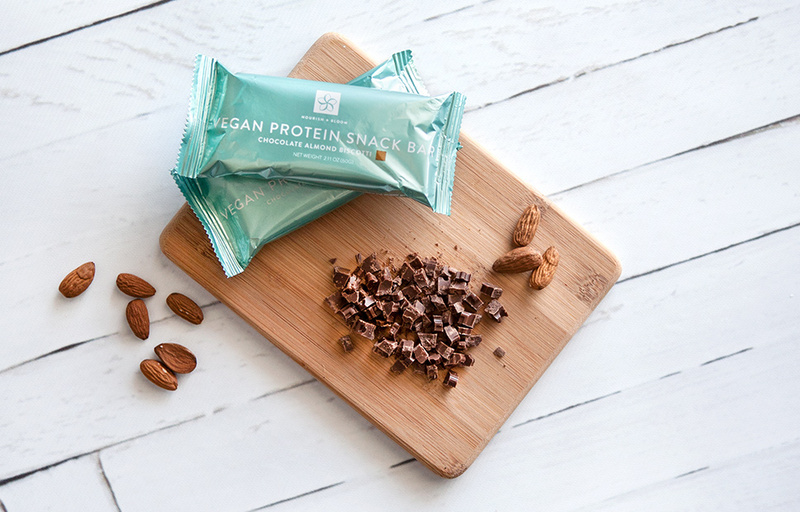 Our Vegan Snack Bars contain 15 grams of protein from peas and cashews. That plus the fiber from chia seeds are sure to keep you satisfied. How many bars are in the box? Each box contains 12 delicious bars. What are other benefits of Vegan Snack Bars? Fiber also helps combat bloat and digestive distress. 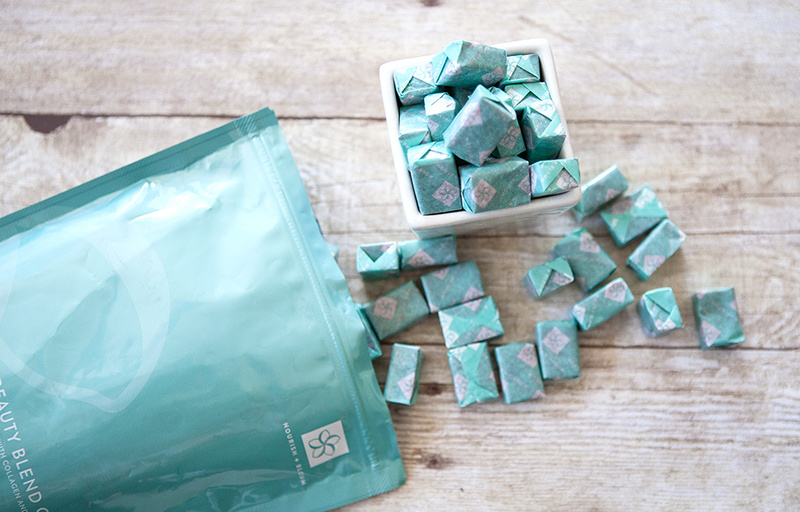 And, with 15 grams per bar, you’ll get awesome support for your digestive system and regularity. Does this product contain any artificial colors or flavors? Absolutely not. 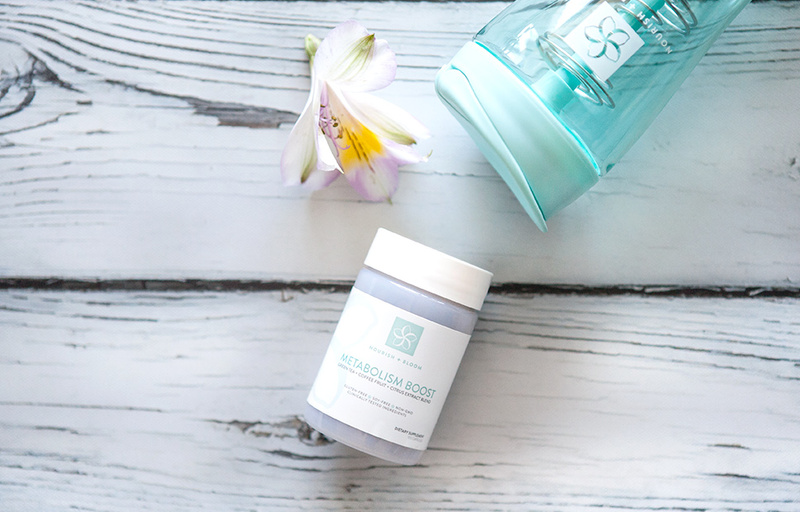 Some of the sweetness in our bars actually comes from the prebiotic fibers (tapioca) that we use, as well as Stevia. Any tips for making my bar extra enjoyable? A warm bar is even more soft and chewy—almost like a warm cookie! If you place your unwrapped bar in the microwave for about 8 seconds, (yes, we know, that’s very specific…but trust us, it works), it will taste even more amazing! Is there sugar in these bars? Our Vegan Protein Snack Bars are sweetened with Stevia. Can I eat a bar as a meal replacement? Our snack bars contain 220 calories, which isn’t quite enough for a full meal. If you’re going to use a bar as a meal, we suggest including something else that contains 100-200 calories. Our snack bars work great as a snack, though. They’re especially helpful when you know you’ll have to wait a few hours before your next meal. I have food allergies. Can I still eat your bars? Please read the label. Our bars contain almonds and almond butter. They’re also produced in a facility that may make other products that could contain egg, soy, milk, and wheat. So, our bars may contain trace amounts of those food items. Why do the bars leave oil on my fingers? Our bars are real food. They’re made with coconut oil and almond butter, so a little oil residue is natural. Keep them stored in a cool, dry place. Are the Vegan Protein Snack Bars safe to eat while I'm pregnant or nursing? Absolutely! They’re a great option because of their protein, carbs, and fat content. So, snack on!